A listener writes “They are real! And they can be viscous!! When I was 15 in my tree stand, my dad and I built permanent stands on the far corners of the 10 acres that my paps cabin was on. He built then 22 feet off the ground! He had his reasons. There were no ladders, we used climbing spikes like pole man used to use to climb telephone poles. Anyway I was 15 it was second day of buck season. It was around 7am. It was snowing so the sun wasnt out full like usual. I heard what sounded to me like a damn bull running through the thickets. There was a deer run just next to it. My stand was about 25-30 yards from where the deer run shot through the thickets. I had clear shots all around. Our stands were built 360 around two giant oak trees. Anyway I was seriously waiting to see a damn brama bull come plowing through this scrub. So I sat on the bench up there and figured whatever it is my chance of getting a buck were gone for next few hours. So I leaned back against the tree and put my 30.06 across my lap. My dad insisted we always loaded heavy with hollow points. My dad reloaded all out ammo. I’m not sure what grain he used in the shells. But I know you couldn’t buy them with that much grain powder in them. Anyway. All sudden everything just goes silent. You know that Erie silence you hear when it is snowing. Like the snow absorbers all sound. No more birds, squirrels, nothing there was no sound. Lime mother nature hit the mute button. Then I saw movement. It was about 6 doe trying to sneak by. When they got near the thicket my jaw fucki g dropped. These doe jumped straight up in the air! And there legs were running in mid air as well. 4 doe sprinted away when the hoofs hit the ground. But what exploded out of the thorny thicket was these two massive BFs they were on top of these does in miliseconds grabbed them by the throats and snapped the does necks as if they were breaking g twigs! These monsters were both reddish brown. There faces were something out of nightmares. I froze. Did not move a muscle. I just watch as they threw these does probably about 150 pounds each over there should like I would have my book bag from school. And then they walked right under my stand. And stopped. Then what happened next it was all I could do not to piss myself. From right under me came this Un holy roar. That seemed to go on forever. The tree stand was vibrating from the sound waves. Then when the roast stopped, I heard the other go like humph!! And then they walked away with their prize over there shoulder. As they walked I watched them and it was if the trees swallowed them up and they were gone. Dads are heros, he would have taken on anything I bet! Makes me wonder if dad knew what the roar was? Very animalistic when you hear them ‘roar’ after their kill?! Would make a good show!? Snowing in Florida?? I used to live there…possible but pretty rare.. maybe a typo? Other than that….bad a$$ encounter! Dad was a hero! It was PA. It was my mistake he lives in FL now and has some strange things going on his property. Thanks for the correction Wes …I figured it was a typo. Hope he comes on the show. I had a couple odd but not definitive things happen while canoeing in a bayou near St. PETE of all places. St Pete??!!! I want to hear about this one? I live in North Tampa but I spend a lot of my free time in St Pete. I’d love to read your story in the blog, or better yet, call Wes. Great Dad you have there. He was coming to protect his son at all costs. Great Dad. Where is the rest of the story…….did he tell hid Dad…….were there foot prints in the snow…??? 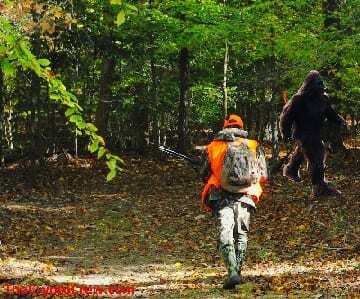 Of all Bigfoot encounters, – these folks that witness the Sasquatch hunting are some of the best for me. I hope he comes on the show and we learn more. Jeeze! This kid had nerves of steel. I hope he tells the story and we get to hear it! I hope he comes on the show. I’d love to hear more. S FL here, bout an hour north of Miami. South central areas near JW Corbett and marshlands along Jog Road, heading west out of Palm Beach are notoriously nasty and are known prowling grounds for these ill tempered things, whatever they are. If anyone wants to go scouting in that area, please go carefully and with numbers and arms. Scary encounter, hope he comes on the show. I’d love to hear the details and description of what he saw. This is a terrifying but awesome encounter.